There are 7 types of Resources in Stormfall: Gold, Iron, Food, Maranian Amulets, Skull Runes, Soul Stones, and Sketches. Resources are necessary for different activities, such as to construct Buildings, discover Lost Arts, and speed up Unit movement or training. Some even unlock unique opportunities, like advanced Building Upgrade levels or new types of Units to add to your army! First, we will talk about Gold and Iron. The amount of Gold and Iron you can produce per hour depends on the number of Townhouses and Mines you have. These can be placed anywhere in the Castle, and it helps to keep all of your Resource Buildings together. The higher the Upgrade level of these Buildings, the higher the Resource production. You can build and upgrade a maximum of 5 Townhouses and 5 Mines to Level 25, but levels past 20 need Sketches to be upgraded. You can make up for any deficiency in your Resources by trading with other players or by raiding and sieging enemy Castles. You can also request Resources by using the League Help feature. A maximum of 50k Iron or Gold can be received from one player per day - a player can receive more than that if it’s from different people. To produce more Gold and Iron, first construct and upgrade your Townhouses and Mines. Secondly, you must increase the amount you can store - this part is limited by the capacity of your Warehouses, but their storage can be increased by upgrading them. If you see the word “Limit” in red next to your Resource amount, you need to upgrade your storage Buildings as soon as possible. There are also Buildings that can increase the production rates of your Resources, although they do not produce Resources directly themselves. The Forge can be upgraded up to Level 7, giving a boost of up to 40% on Iron production. Dungeons can be upgraded up to Level 5, and that will give a maximum boost of 25% for Gold production. Food is collected from Farms. Build and upgrade your Farms, and the Spring of Life, to increase your Food production. The amount of Food you can store in your Castle is limited by the capacity of your Barns. Like for your Warehouses, make sure you upgrade your Barns at the same rate as your Food production, or anything produced when you have reached the limit will go to waste. 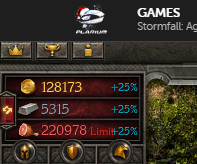 You also need Food to maintain your Units, as every Unit in the game consumes its own set amount of Food per hour. If you run out of Food, your will have to raid to train more Units. Alternatively you can exchange excess Resources at the market for other Resources you’re low on, or your allies can gift them to you as we covered earlier. Barns and Warehouses can be upgraded up to Level 25, and three of each can be built - this gives you a total capacity of 389997 of Iron, Gold, Food, or Maranian Amulets. 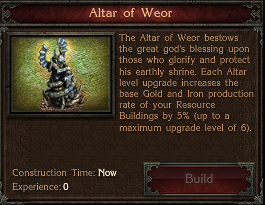 Additionally, the Altar of Weor (available from the Black Market with Sapphires) also provides up to a 25% boost on Iron and Gold production. The best time to get the Altar is when there is an active discount for it. Maranian Amulets are a special Resource that allow you to summon Vampire Units. When in possession of the Amulets, you are able to summon all types of Vampire Units which include Seekers, Lost Ones, Priestesses, and Reiters. To earn Maranian Amulets you must first sacrifice some of your Gold and Iron to Mara. To do this, you need to go to the Altar of Mara and select the amount of Resources you will sacrifice in exchange for Amulets. The amount you choose is completely up to you – however, it will affect the amount of Maranian Amulets you receive. Honor Mara by sacrificing 500 Gold and 500 Iron, and after 1 hour you will be rewarded with 500 Maranian Amulets. Mara will always reward you in the same ratio; selecting shorter periods of time will also increase the response speed to your offerings with Amulets. Sapphires are considered hard currency, since they can be bought using real money. You can also receive them from Global Quests and in Feats of Valor Rewards. Remember, being in an active League grants more opportunities to get Sapphires! You can use Sapphires to temporarily boost your Resource production, boost the rate of your construction, reduce the time needed to discover Lost Arts, and speed up Unit training. Furthermore, they allow you to produce Imperial Units, get Fortifications, Improvements, Revive Units, get Chests and Keys for Hero Equipment, and get exclusive Units like Thieves, Wraths of Weor, Legendary Units, and Champion Units. It is always recommended to get Items and Boosts when there are discounts available. Don’t miss an opportunity to improve your strength! This article was written by player WARRIOR, who granted permission for it to be posted on Plarium.com. Any thoughts or views expressed herein are the player's own, and do not necessarily reflect the views of Plarium Global.